The Extra Heavy Mexican Yoga Blanket is a perfect accompaniment to the yoga studio, laying out on the beach, an impromptu picnic or in the car/office for extra chilly mornings! You will love using this functional yoga prop rolled or folded up to support your poses, or spread out to keep you warm in restorative yoga and savasana. 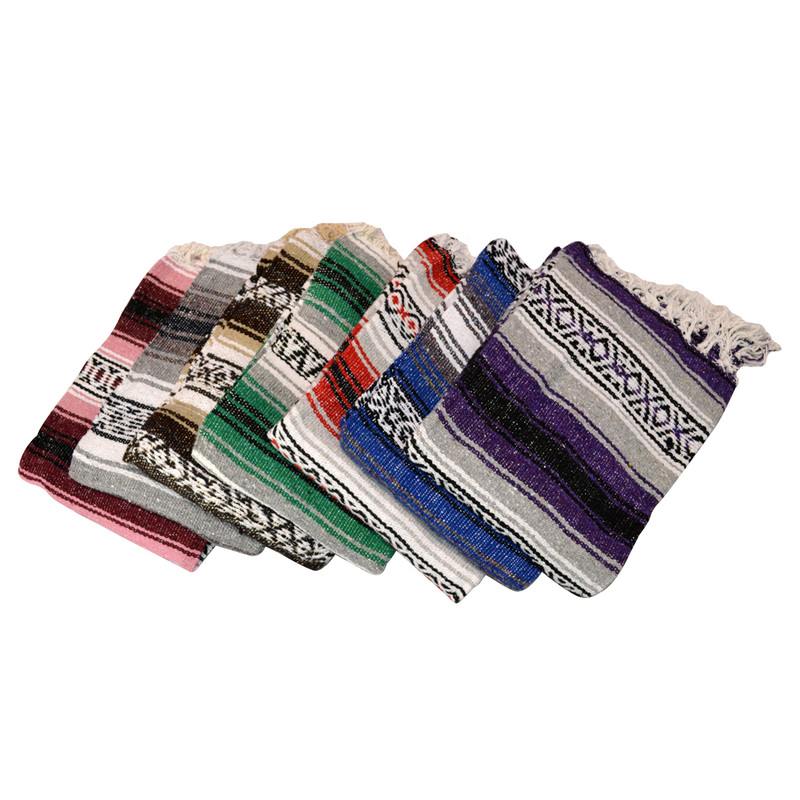 This is a heavier, denser version of our best-selling Traditional Mexican Yoga Blanket, with a tight, thicker weave for extra stability and support. Machine washable on cold cycle and tumble dry on low or hang dry. PLEASE NOTE: Tassle colors vary from whites, naturals, and grays. We love these blankets, the colors change from time to time so it is interesting to see the dye lots and more color options. The density is our favorite part, as we count on great support from yoga blankets for many poses. And, they wash well without shrinking. We will be ordering more of these heavy weight blankets! I love these blankets and use them in my special backyard garden dining & lounge area. They are perfect on my Teak Dining Chairs as a seat cushion alternative, and look great in all the different colors draped over the back of the chairs when not being used as a cushion. I also use some draped on my Teak Double Lounge Chair. Perfect for wrapping yourself up in one on a coolish evening. Super cozy and soft with beautiful colors, perfect for yoga practice or just plain relaxing. I love this blanket!!!!! I have found that these are far superior to any other blankets that I have ordered. I think that this company would benefit from some additional advertising. My job at both the yoga studio and day job. So for free...my review is that this is a very high quality product. Shipping was prompt, and resourceful as rather than forcing items into one box there were two packages sent and I will be ordering again soon. Soft and heavy as described; very satisfied with this purchase. I was worried the this blanket would not be soft for this price. Its super soft. love my blanket. The density and weight of this blanket is perfect for use as a prop in class. This is my first choice for a blanket choice. Very nice blankets. My students liked them a lot. This blanket is an excellent value for the price. It serves well for support and nice texture.